For anyone who loves to boulder, a pilgrimage to Hueco Tanks State Park & Historic Site is inevitable. And it’s no wonder: This beloved Texas landmark is considered the mecca of modern bouldering, with a style of climbing found nowhere else in the world, all set against the backdrop of stark desert and reddish-brown rock. It’s the birthplace of the V-grades, the national bouldering standard, and the first place where climbers flocked purely for the boulders rather than roped routes. This ancient place also has a 10,000-year-old legacy, where prehistoric people hunted now-extinct bison, sought shelter, and performed sacred ceremonies commemorated on the rock through paintings. From early inhabitants to rock climbers, Hueco Tanks, which is located about 32 miles northeast of El Paso, is indeed a sacred space, one that every climber should visit to experience some of the best bouldering in the world. Any climber will tell you that the rock at Hueco Tanks feels like it was made for climbing. Hueco’s boulders are bullet-hard, with features found nowhere else in the bouldering world, like the surfboard hold on the Moonshine Roof or the impressive Martini Cave. This ancient igneous rock provides a place for complex movement that’s gymnastic-like and physical, yet delicate and technical. It’s one of the best places in the world to climb complex roof problems and helps climbers develop a combination of technique and strength in their climbing. The rocks at Hueco Tanks are actually a remnant of uplifted domes of molten rock that were weathered and eroded over millennia and now contain “huecos,” or “hollows.” The hollows refer to the depressions in the rock that are perfect for holding water, providing an oasis for plants, wildlife, and humans—and now for the hands, feet, and knees of rock climbers. 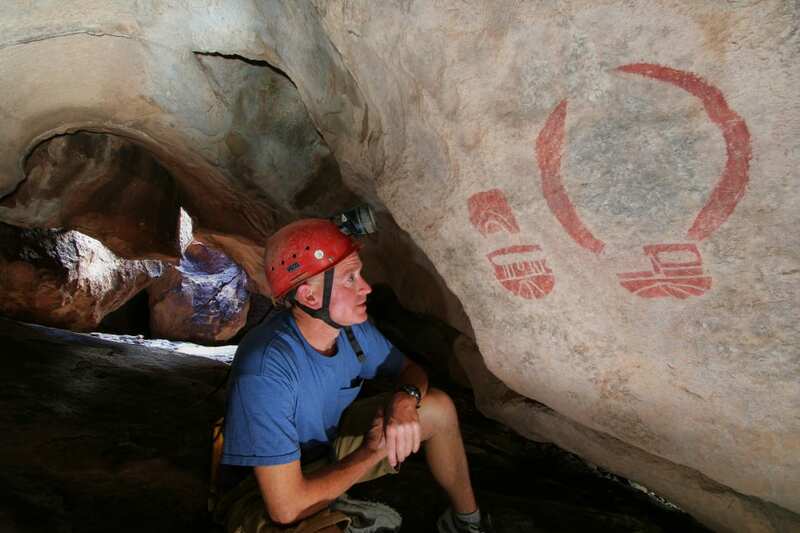 But Hueco hasn’t always been a rock climbing destination—humans have inhabited Hueco Tanks for millennia, leaving their mark on the area in the form of rock art paintings, or pictographs. 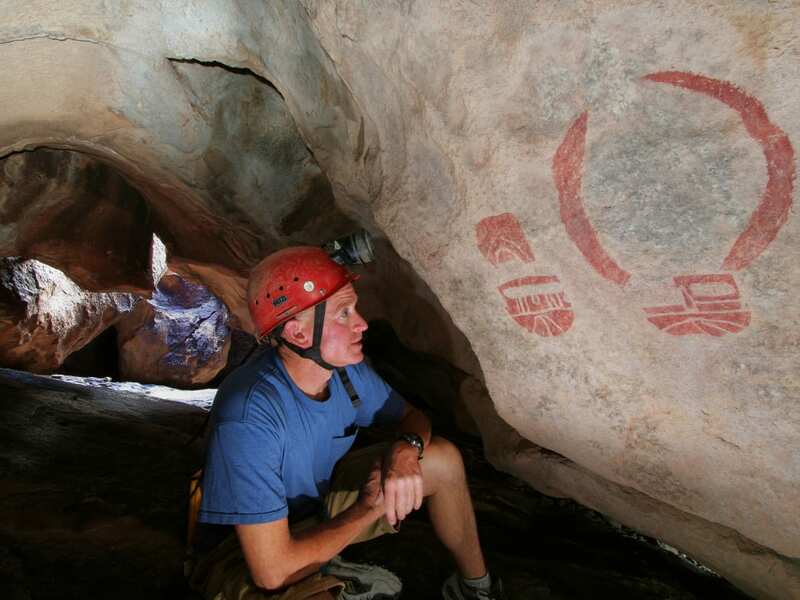 The collection of rock art in Hueco is remarkable, with thousands of paintings by multiple groups over the course of 10,000 years. Painted masks with almond eyes and square faces stare out from the rock, along with ancient Mexican gods resembling serpents or jaguars. Hunting scenes abound, with horned humans and tiny, delicate deer and mountain sheep. Mysterious wavy lines and abstract symbols from ancient humans still stump archaeologists. More recently, modern nomadic Native Americans like the Kiowa and Apaches have left their mark, too, drawing pictures of elaborate victory dances and hunts. As European and Spanish traders entered the scene a few hundred years ago, Native Americans drew pictures of cattle, churches, horse riding, and people dressed in European clothing. Today, the only new marks on the rock you’ll see in Hueco Tanks are chalk ones on bouldering holds. But Hueco wasn’t always a bouldering destination. Early climbers boldly tackled the surrounding cliffs using ropes, minimal trad protection, and the occasional bolt. But over decades, climbers began exploring the bouldering potential of Hueco, and the results were impressive. In the 1970's, Mike Head established the Mushroom Roof in Hueco, comparable in grade to Yosemite’s bouldering test piece of the time, Midnight Lightning. This was unprecedented—until that point, Hueco was just a local crag, and besides, bouldering was usually done to train for big-wall summits, not for its own sake. But over the next decade, climbers headed in increasing numbers to Hueco, attracted to the pure joy of working and finessing moves on a small-scale environment, pushing their limits of strength, technique, and power as they topped out the boulders. It wasn’t until climber John “Vermin” Sherman came to the scene in the 1980's that the story of these desert boulders was forever changed. Sherman established more than 500 bouldering routes of varying difficulty, and soon, Hueco Tanks became the first major place in America where people gathered to boulder rather than to climb tall walls. As the sport became more popular, the need for a bouldering guidebook began to emerge, and Sherman rose to the challenge, publishing Stone Crusade: A Historical Guide to Bouldering in America in 1994. His original manuscript didn’t include a grading system, because according to Sherman, “Numbers got no soul. People need to get over that stuff.” But his publishers required it, so he set about creating a grading system using the “V for Vermin” grades that he and his climber buddies had jokingly used to grade their first ascents. Joke or not, it was the first time in the U.S. that an open-ended grading system had been used for boulders, and it established Hueco as the standard setting area across the nation. Now, the V-grades are used throughout North America, at every climbing gym and in every outdoor bouldering area. After Sherman’s guide came out, bouldering in Hueco blew up. Visitors swelled in the 1990's as Hueco Tanks was featured in climbing magazines and established climbers came from around the world. But all that popularity came with a downside, and the Texas Parks and Wildlife Department became concerned with the impact that visitors were having on the vegetation, wildlife, and the potential harm to archaeological sites and pictographs. In 1998, park officials created the “Public Use Plan,” closing two-thirds of the park (East Mountain, East Spur, or West Mountain), unless visitors enter with a park-approved tour guide, and limiting access to the North Mountain to only 70 people a day. To visit Hueco, it’s essential to plan ahead as early as possible. Call Texas Parks and Wildlife Department’s Hueco Tanks reservation line up to 90 days in advance to snag a spot. Once you have a reservation, show up at the park gate before 10 am to claim your spot, or call the parks to hold your reservation if you’re late. This will allow you to enter the North Mountain area, the only area open to self-guided visitors. If you don’t have reservations for the North Mountain, there are two options for access: Show up at the gate before 8 am to wait in line for any open reservations (the park saves 10 spots a day for walk-ins), or come after 10 am, when all unclaimed spots open up. Tours meet at the front gate, and sometimes they’ll have open space and you can join. The other way that people get into the park, and the only way in to East mountain, East Spur, or West Mountain is with a guide. The park’s guides take groups out bouldering or to see rock art, making sure that leave no trace ethics are followed and that park rules are closely observed. There are two types of guides in the park: volunteer and commercial. Volunteer guides cost about $3 a person, but availability depends on the guide’s schedule. Call or check in at the park entrance to request a volunteer guide, and the park will let you know if a guide picks up the tour. Book a commercial tour if you need to guarantee availability, prefer to communicate with your guide regarding your ideal agenda for the day, and don’t mind shelling out up to $25 a person. All visitors must pay the $7 entrance fee or purchase the annual Texas State Parks Pass for $70, which allows access to the park for everyone in the car. The most popular place to stay is the Hueco Rock Ranch, where climbers gather to hang out, share tips on boulders, and soak up the desert scenery. It’s $10 a night to camp ($5 for American Alpine Club members), or you can rent a bunk or private room. There are showers, a barn, sheltered communal cooking area, and fire pits for campers to enjoy. Quieter camping can be found at Gleatherland, with great views, showers, a fire pit, and WiFi, all for $5 a night, but you’ll need advance reservations. Rent a private room or a bunk room at the Hueco Hacienda, and take advantage of the full kitchen, dining room and living room, as well as crash pad rentals, WiFi, and showers. The best time to boulder in Hueco Tanks is November through April, and the most popular time is during January and February. It will be sunny during the day and chilly at night, so don’t forget your puffy jacket and slippers! The Hueco Rock Rodeo bouldering competition hosted by the American Alpine Club, usually in February, is a lot of fun to attend, but you’ll want to book lodging and park reservations in advance. Written by Jacqui Levy for RootsRated.